At Bridge to Health Chiropractic our vision is that everyone will discover their full potential. Through exceptional chiropractic care and an unparalleled commitment to patient satisfaction, we encourage your bodies optimal function. From the moment you walk into our office and during each visit with Dr. Tiffany, we’ll explain how chiropractic adjustments encourage your body’s innate ability to heal. You’ll also learn how certain lifestyle choices can support chiropractic adjustments and lead to improvement in youroverall health. We value your time and work hard to keep your appointments brief and efficient, while still giving you the quality time you deserve. Your new patient exam will take approximately 45 minutes; this time may vary depending on prior completion of our New Patient Intake Forms, popular appointment times and severity of patient complaint(s). We ask that you come to your appointment with completed paperwork, two forms of identification, and your insurance card if applicable. You will be greeted by one of our excellent staff members and then escorted back to our new patient exam room. During your first appointment you will receive a through health assessment to determine how our expert chiropractor, Dr. Tiffany, can help relieve your symptoms and improve your health with out drug or surgery interventions. Dr. Tiffany will perform several evaluations including posture, range of motion, full nervous system, palpation, and x-ray if necessary. You will receive your first adjustment if Dr. Tiffany determines it’s appropriate to do so. 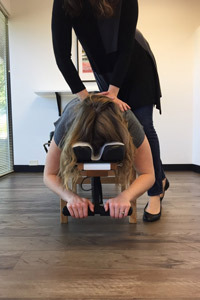 During your second visit you will learn about the brain body connection and subluxations – also known as nerve interference that can disrupt the communication between your brain and your body. Dr. Tiffany will explain to you the treatment plan she created based on her findings from your first visit and your personal health-related goals. Lastly, we will go over your insurance benefits, if applicable, so you know what to expect your insurance company to cover and if your visits will require and out-of-pocket expense. We recommend having the support of your spouse or other family member at this appointment with you. This appointment usually lasts 20-30 minutes depending on severity of patient complaint(s). During your regularly scheduled visits, Dr. Tiffany will perform a chiropractic adjustment to correct any subluxations (misplacement of spinal vertebrae), in your spine. Our Chiropractic Assistants (CAs) may then walk you through a series of stretches and/or traction activities to improve your spinal alignment. Regular chiropractic checkups are never mandatory, of course, but once you find out what your body feels like being in alignment you are going to want it checked — hopefully for the rest of your life. Regular checkups are important to make sure your nervous system is in alignment. You’re likely to want to continue care because you love it so much not because you have to. Expect a great experience at Bridge to Health Chiropractic. We look forward to helping you feel better than ever. Contact us today for an appointment!